Within the last year, and especially within the last three months, there has been a lot of speculation about where Marcus Mariota would end up in the NFL draft. Multiple scenarios swirled around as the draft began to get closer and closer. No team was mentioned more than the Philadelphia Eagles, due to the fact that Chip Kelly (the person who recruited Mariota out of high school) is now running the up-tempo blur offense in the NFL. 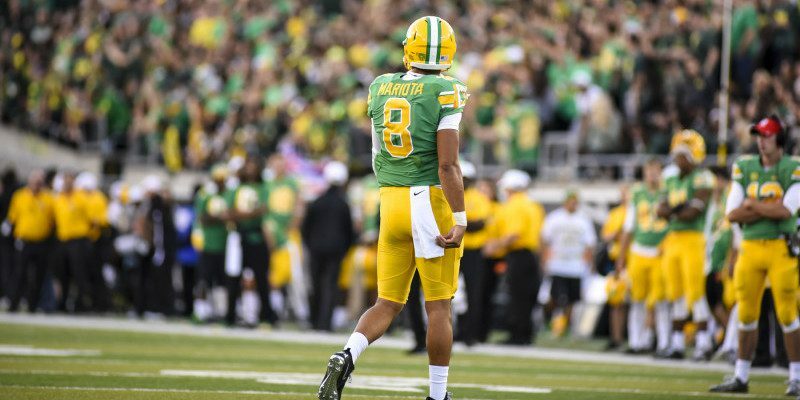 The fit and transition for Mariota would be much easier than being placed into a pro-style system. This all seemed great, but there was one big problem: the Eagles were nowhere near the top of the draft board, and would have had to sacrifice a lot to get there. Kelly has proved that he believes in his system over players. He has traded or released pro-bowl quality players in both seasons at the helm. In Kelly’s system, nobody is safe, but having Mariota in Kelly’s system may be one of the safest decisions the Eagles could have secured. Here is why Chip Kelly and the Eagles should have gone all in on obtaining the No. 2 overall pick in the 2015 NFL Draft, and selected Marcus Mariota. 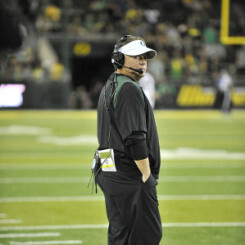 Chip Kelly looking on during the 2012 football season. In today’s NFL, the average coach lasts 2-1/2 years as a head coach before being fired. Since the moment Chip Kelly left Oregon and took the Philadelphia Eagles head coaching job, he has been under scrutiny. Under Kelly, the Eagles have finished 10-6 for the past two seasons, but are still searching for their first playoff victory under the new head coach. Kelly has proven he isn’t scared to take chances when it comes to players. The mantra “Next Man Up” is another reason why Philly should have mortgaged the future and done whatever he could to get Marcus Mariota. In the NFL, you don’t have time to look two or three years ahead. You have to win in the now, and if that means giving up future picks as well as players on your roster that are expendable in order to obtain a high-quality quarterback, then so be it. The chance to have a high-level quarterback with immediate results trumps the hope of a successful draft pick two years down the road. Yes, moves like that are the ones that get coaches fired, but if you’re true to your word and trust your system as Kelly does, there shouldn’t be such thing as a “steep asking price.” Having a high-level quarterback is what puts a team in the best position to win a championship. 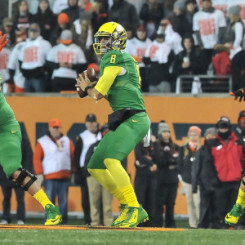 Marcus Mariota drops back for a pass against Oregon State University. Kelly has proved his system can win in the NFL, but for his system to go to the next level, he needed a star quarterback. The star quarterback Kelly needed was Mariota. Mariota is the prototype quarterback to run Kelly’s spread offense, and he proved that while at the University of Oregon. Mariota is Kelly’s guy; nobody else in the NFL or in the draft fits the system as well as Mariota. You don’t win championships in the NFL with average or sub-par quarterbacks, and Kelly’s best option to obtain a potential star has passed him. No, Mariota isn’t proven in the NFL, but with a system that could optimize his potential, the Eagles already had a pressing reason to trade for him. Kelly and the Eagles put too much emphasis on the things they couldn’t control instead of what they could. The Eagles were mentioned to have offered their first-round pick this year, Sam Bradford, as well as next year’s first-round pick. Those choices have variables attached to them. The picks are unknown — you don’t know who will be available at the time of your selection. As for Bradford, he has missed the last two seasons with torn ACLs. Yes, this may seem like a lot, but to entice the Tennessee Titans even more Kelly could have offered players — players that are definitely good, but could also easily be replaced via the draft or free agency. Scenarios like this don’t happen every year. And unfortunately for Chip Kelly and the Eagles, they may have lost out on their best opportunity for success.